Kelvin Gastelum was born on the 24th of October 1991 in San Jose, California. He is of Mexican decent. He fights in the middleweight division but have previously fought at welterweight. He is the winner of The Ultimate Fighter 17. He was a state champion in wrestling but decided to pursue a career in MMA. He has a purple belt in 10th planet BJJ from founder Eddie Bravo. 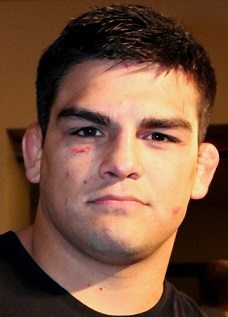 Kelvin Gastelum made his MMA debut in December 2010 and defeated Jose Sanchez by submission (punches). He won his first five fights all by stoppages. After competing in Cage Rage he got his shot to participate in The Ultimate Fighter 17. Kelvin Gastelum entered The Ultimate Fighter as a relative unknown and was on Team Sonnen. He won all his fights in the house and faced off against Uriah “Primetime” Hall in the finals. Hall had been knocking everyone out and produced the most vicious knockout in TUF history, in his fight against Adam Cella. He made his UFC debut on the TUF 17 finale and won season 17 by decision. The fight was contested at middleweight. He moved down to welterweight and won his four fights before he hit a stop in the future champion Tyron “The Chosen One” Woodley. Gastelum missed weight for the fight and had to give 30% of his purse to Woodley. Woodley didn’t take the money. Gastelum lost by split decision. 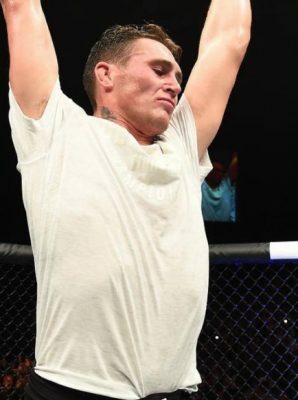 He moved up to middleweight and made a successful return against Nate Marquardt who he beat by TKO when Marquardts coach called off the fight. Then he lost to Neil Magny via split decision in their main event fight in Monterrey, Mexico. He fought twice in 2016 and defeated Johny Hendricks and Army veteran Tim Kennedy. 2017 started off great with a TKO of Vitor Belfort. The victory was overturned when he tested positive for THC. In his last fight he was finished for the first time in his career when he faced off against Chris Weidman the 22nd of July. He lost the fight by submission (arm triangle choke). At time of writing the UFC doesn’t have a planned fight for Gastelum but he has expressed a desire to move back down to welterweight.